Making real armor is a serious undertaking. Fortunately, making realistic looking armor is not. Whether for a costume party, Halloween or just for fun, you can make authentic looking body armor using some commonly found household materials and perhaps a trip to your local hardware store. This armor will not actually protect you, but it sure will look like it can. Trace an outline from a t-shirt of the person who will be wearing the armor onto a sheet of cardboard. Do not include the sleeves. Make a separate front and back outline. It is not important whether the cardboard has any printing on it or not. Cut out the front and back panels from the cardboard sheet. 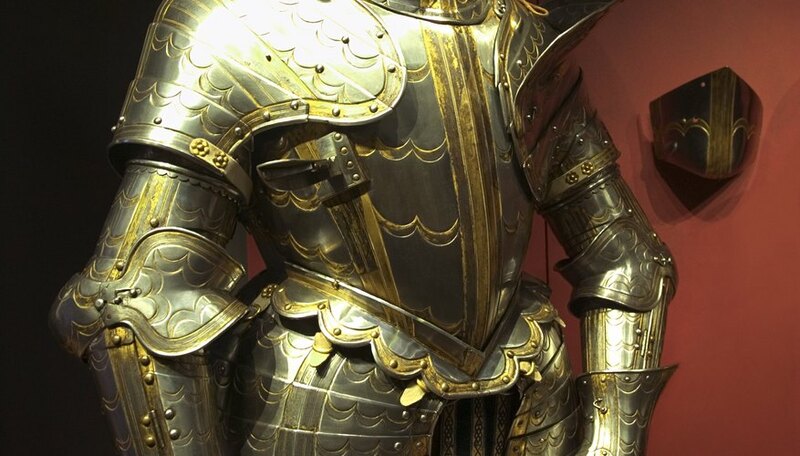 Hold them against the chest of the person who will be wearing the armor and make any alterations needed so that the panels fit the wearer nicely. The edges at the shoulders and along the sides should match up closely. Cut out two squares measuring about 5-by-5 inches with rounded corners and six smaller squares with rounded corners measuring about 2-by-2 inches. Place these squares onto the front piece to act as pectoral and abdominal muscles imprinted into the armor. Tape the front panel with the muscle cardboard cutouts all over its surface, using some masking tape to secure them in place and to blend them into the armor. Cut six hook and loop straps to about 6 inches each. Be sure to include both sides of the straps, then glue one side to the front and the other to the back. Glue them on the inside surfaces of the armor using some cyanoacrylate glue, with one on each shoulder and two on either side of the armor. Lay both panels on the ground and spray them with a coat of silver spray paint. This will make the armor look like metal. Add some splattering of black paint to darken, if needed. Allow for the paint to dry, then mount the armor on the person using the hook and loop straps to hold it in place. Try painting the armor with gold or black spray paint to get a different look.